Updated Apple has blamed a server configuration blunder for a 10-hour-long outage of its highly lucrative App Store, Mac App Store, iBooks Store, and iTunes Store yesterday. The iPhone giant said in a statement to the media that today's downtime was caused by problems with its DNS setup. Apple's system status page confirms various websites are titsup, leaving people around the world unable to buy stuff and download software. Apple rakes in about $2.19m an hour in revenue from its iTunes and software stores, so that DNS bungle has cost the biz at least $21m today, we reckon. "We apologize to our customers experiencing problems with iTunes and other services this morning. The cause was an internal DNS error at Apple," the Cupertino idiot-tax operation's press team explained. "We're working to make all of the services available to customers as soon as possible, and we thank everyone for their patience." As of 1230 Pacific Time (1930 GMT), the web shops were still knackered. Apple has yet to provide any update on when the service will be restored. The sites fell over at about 0200 PT (0900 UTC), with users reporting a "Status_Code_Error" message when attempting to connect to the service. 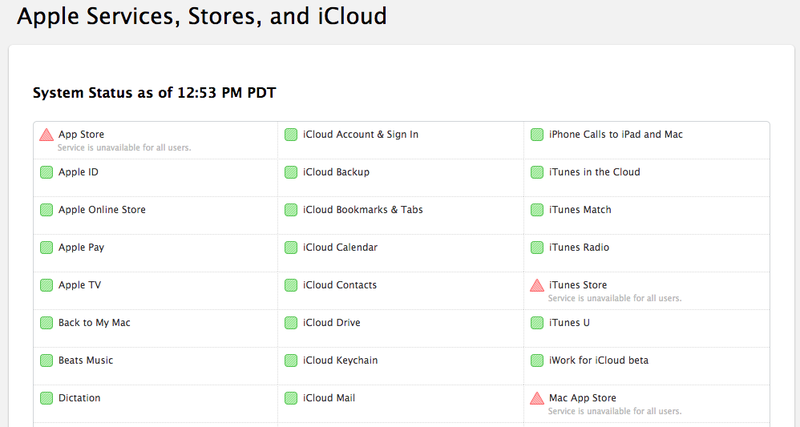 The iCloud service was also down for a brief period but has since recovered. The problems come at a rather inopportune time for Apple: the biz is enjoying acres of rapturous copy after CEO Tim Cook unveiled a new MacBook and set a firm release date for the Apple Watch. Apple says its stores are now back to normal, and claims they recovered around 1300 PT (2000 UTC). This morning (GMT) all stores appeared to be operating normally. Snafu over - for now.